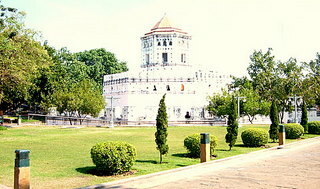 Fort Phra Sumen was constructed in 1783 to fortify the old city during the reign of King Rama I. It's one of the two remaining forts from that period. 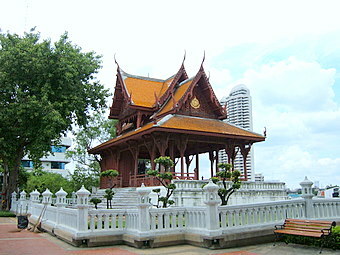 When Bangkok was established as the new capital, forts were built to cover the Chao Phraya River. The defensive rings of canals protected the old city to the east. 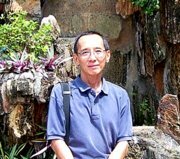 The fort is sited at the confluence of the Chao Phraya River and the Banglamphu Canal which was the second ring of canals to be built around the old city of Bangkok in 1782. The first canal was Lod Canal just east of the Grand Palace. The Banglamphu Canal joins up with the Ong-Ang Canal and extents all the way to the Chao Phraya River to the south, forming a moat to the east of the old city. With the Chao Phraya River to the west, the old city is virtually an island, thus the name Rattanakosin Island. 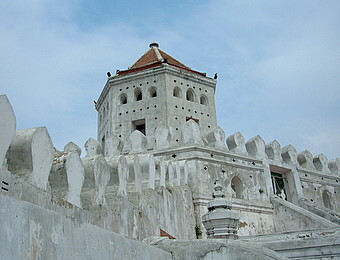 The fort has two levels of battlements where cannons are deployed and an observation tower. It covers the bend of the Chao Phraya River at the northern end of Rattanakosin Island. 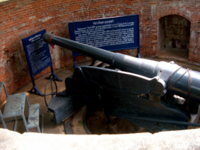 The old cannons are still in place. 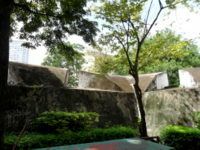 A well-kept park, the Santichaiprakarn Park lies between the old fort and the river making it a pleasant area to spend the day by the river. One can have a panoramic view of the riverfront and watch river life go by with the majestic Rama VIII suspension bridge in the distance. With the march of development only two of the 14 forts are left standing today. 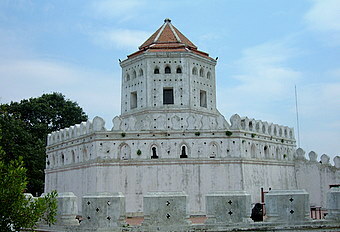 This fort is one of the remaining Bangkok legacies of a bygone era. The most convenient way to get there is by Chao Phraya River boat. Take a Bangkok skytrain to the Taksin Bridge pier. Go to the Sathorn Central pier that’s just under the bridge and take a Chao Phraya River boat to N 13 Phra Arthit (Banglamphu) Pier. The following types of Chao Phraya River boats stop at Phra Arthit pier. When you alight from the boat, walk out to the main road, Phra Arthit Road and turn left. 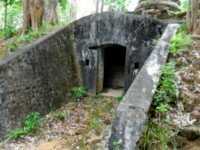 Fort Phra sumen is about 300 m down the road. Bus service no 32 from Wat Pho passes Phra Arthit Road. Take the bus on Maharat Road that’s between Wat Pho and the Chao Phraya River. 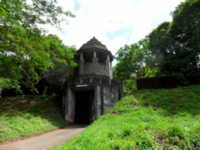 Bus service no 53 passes Fort Phra Sumen. Take the bus from Hua Lamphong – Yaowarat Chinatown – Pahaurat Little India – Pak Klong Talat – Maharat Road – Phra Arthit Road – Phra Sumen Road. For the other Bangkok Forts.